It's been a rainy August in the Ozarks, and one of the side-effects is that lots of native fungi are popping up. This little fellow is about two inches tall, and looks like there should be a garden gnome nearby. General rules for mushrooms: If it's a mushroom, and you don't know what it is, don't eat it. If it's a mushroom, and it's bright red, don't eat it. 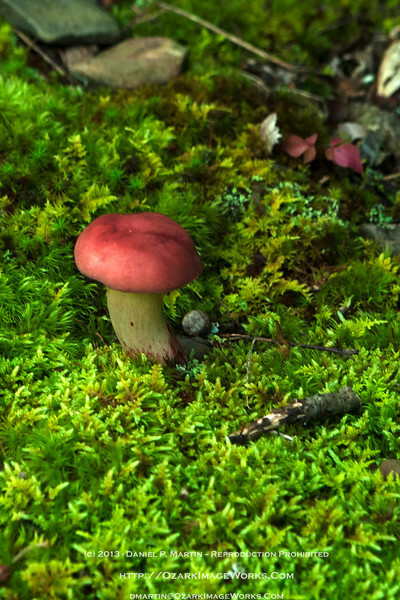 It's cute to look at, but all of the different varietes of Emetic Russula are called "emetic" for good reason -- they're moderately toxic and induce vomiting. ...proving, once again, that imagination is lots more fun than reality.